Zurich-based saxophonist Michael Jaeger and his band Kerouac have been a well-known entity in the European progressive jazz community amid alternating personnel since 2006. Jaeger is a musical voyager and covers a broad sound-design spectrum, steeped in prismatic colorations and the axiomatic peaks and valleys. Rather uncannily, the musicians impart numerous variables as they shape a mark of authenticity, when considering a group-centric concentration. 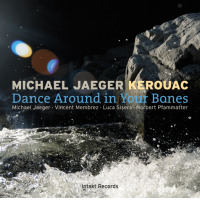 Jaeger mixes it up via whispery clarinet sequences atop popping bass ostinatos on "Dance Around In Your Bones," where pianist Vincent Membrez circles around the primary theme and bassist Luca Sisera's booming ostinato that sets the band in motion. With hints of world music and imaginative storylines, the quartet presents quite a few contrasts, honed down by drummer Norbert Pfammatter's weighty backbeats and some hot and spicy breakouts. Moreover, they gel to a quirky and adventurous groove on the highly expressive "Door in the Door," heightened by Pfammatter's rumbling and crashing rhythms. Diversity is a key component throughout the production. The musicians impart steely edged treatments and ethereal tapestries during "Road Stop" and employ twisting and turning metrics on "Apfelklappe," nailed down by a sprightly rock pulse, proffering a strong vehicle for Membrez to expand. Here, they articulate a conglomeration of mood- evoking paradigms, devised upon a layered approach and shaded with transcendent overtones. 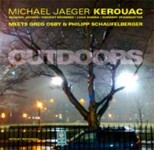 Jaeger's Keroucac band serves up a multidimensional program, brimming with numerous subtleties, shifting tides, and oscillating choruses, often characterized by a spiraling impetus. Ultimately, the bulk of these works are mechanisms for the ensemble to discover and reenergize a host of thought-provoking propositions. Track Listing: Dance Around in Your Bones; We Shouldn’t Forget the Spell; Gate; Door in the Door; Mondsichel; Frog Spell; Manitoba; Road Stop; Apfelklappe. Personnel: Michael Jaeger: tenor saxophone, clarinet; Vincent Membrez: piano, prepared Piano; Luca Sisera: bass; Norbert Pfammatter: Drums.